If you’re bored with Gonzaga and don’t really care about Kansas or Syracuse, if you think Auburn should stick to football and you have no clue what or where Fairleigh Dickinson is, and you’re just plain looking for a team for which to root during the first two rounds of the NCAA Tournament here in Salt Lake City, we’ve got the one. A team for you to dial in on, to watch, to adopt. Your team. The New Mexico State Aggies. Not only are these guys lovable underdogs, a 12-seed from the WAC going up against the SEC’s fifth-seeded Auburn on Thursday at Vivint Arena, they are kind of weird, in the best sense. They do things in ways rarely seen in college basketball. If you’ve never watched the Aggies — and chances are you haven’t — they play as though they are … well, the Philadelphia Flyers. They not only move and share the ball and their playing time, they employ line shifts in the middle of the action, replacing an entire group with a fresh one, changing up three, four, five guys at a time. You can almost imagine them climbing over the boards and skating out in their Nikes to do their business. On this team, bench players don’t stay seated for long. They go 12, 13 deep. If they dress, chances are they’re going to sweat through their jersey. Stars don’t play all that much more than the role guys, nor do they lord over their teammates. That’s not only unusual, it’s pretty cool. “There’s nobody in our league that plays like them,” Auburn coach Bruce Pearl said. The Aggies are a diverse group, a bunch of big-school castoffs and junior college transfers coming to Las Cruces from all over the place — Florida to California, Canada to Texas, Senegal to Spain and points in between. One of them — JoJo Zamora — used to play for Utah. And they breathe, run and play as a single organism. • Auburn (5) vs. New Mexico State (12), 11:30 a.m.
• Kansas (4) vs. Northeastern (13), 2 p.m.
• Gonzaga (1) vs. Farleigh Dickinson (16), 5:27 p.m.
• Syracuse (8) vs. Baylor (9), 7:57 p.m.
A lot of teams move their lips in concert, in that direction. The Aggies actually mean it. It might not be all that much fun if it weren’t for the fact that New Mexico State wins by the truckload. The Aggies put up a record of 30-4 this season, the second under coach Chris Jans. He is the one who made the determination for his team to throw numbers at opponents. But, on Wednesday, Jans said the key to a win over an opponent like Auburn is the way whoever is on the court at one time connects. 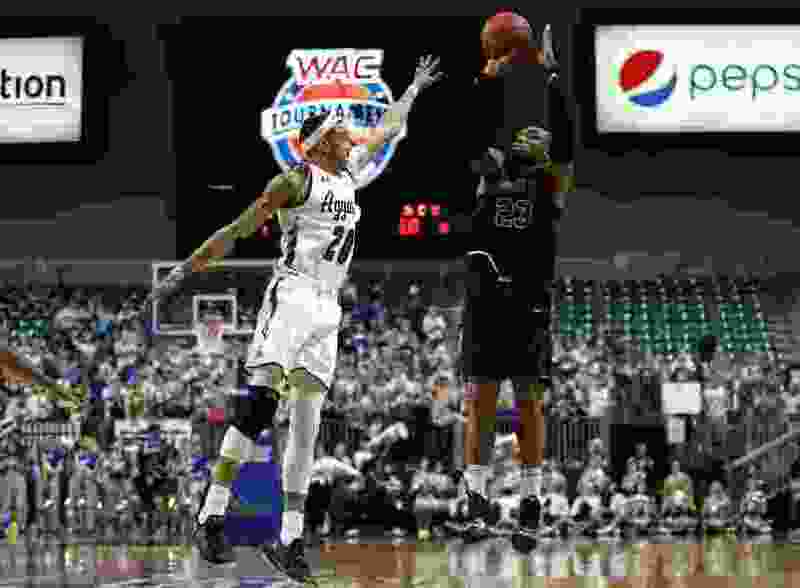 The Aggies like to spread the floor and bomb away, having launched nearly a thousand 3-pointers, and they score better than 78 points per game. They also have built a 10-plus rebounding margin against opponents, including an average of 13 offensive boards. Auburn is better than most of the teams New Mexico State played this season, and comes in having won the SEC tournament, which included a rout of Tennessee in the final. The Tigers most definitely will be difficult for the Aggies, who have a track record of losses in the NCAA Tournament, the school losing 12 straight. But those were other Aggie teams, not this one. That’s, at least, the way the current players are looking at it. Whether the infamous 12-5 upset plague will come into play here depends, more than anything, on New Mexico State’s level of confidence and execution. They’ve certainly got the former covered.